Propsummit.com a Blade Runner Prop Community Forum BladeRunnerProps.comView topic - Familiar face in Leons' bathroom? Familiar face in Leons' bathroom? Posted: Sat Aug 20, 2011 4:42 am Post subject: Familiar face in Leons' bathroom? I'm sure many of you have already looked into this, so forgive me if this is old news. I'm new to the forum and have'nt yet seen any posts related to this matter. 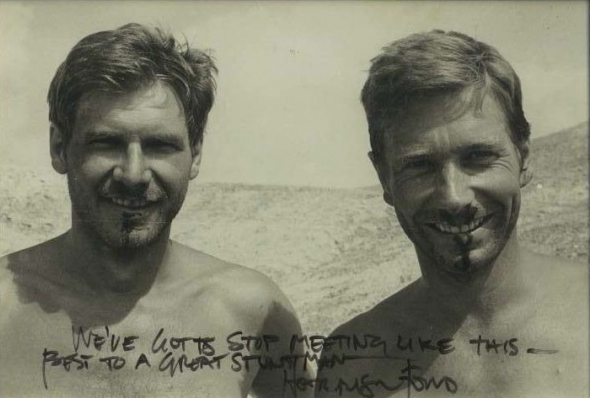 Those of you that have read Vic Armstrongs' book will be aware that during post production in the UK, Ridley asked Vic who he knew as a Harrison double, and whom he had worked with as a horse trainer/provider, to stand in for Harrison in a couple of pick up shots. Specifically the bathroom sequence in Leons' apartment. Although some set ups were done at Pinewood the bathroom set was actually re-created at Elstree Studios. From the moment Deckard enters the bathroom and right through to the snake scale discovery and up to the exit of the bathroom, it is Vic Armstrong playing Deckard. As I said, many of you will already know this but I've just finished Vics' book and it gave me a renewed aspect on BR. BTW, it is a great book and well worth looking at if your a film buff, some amazing insights in there. "The Casablanca of science fiction movies". Woaw...I gotta see that scene again to make sure. Check out the actor in profile, if you've seen pics of Vic Armstrong you will recognize him instantly. I'll certainly freely admit that I, for one, didn't know anything about this neat little bit of BR Trivia! VERY cool to learn this, PS... Thanks for sharing it. Please, if any other additional little bits of info like this come out of reading Vic's book, don't hesitate to share it. As someone who doesn't have a copy of the book himself, I love learning of these little nuggets of insider info... It sure was news to ME. Yep, It's talked about on a documentary on the suitcase edition release, and I think Ridley Scott talks about it on one of the audio commentaries too. There is additional footage of the scene too. I thought this had been common knowledge for years? it was mentioned way back in Future Noir.....page 129. And as Noeland says commented on by Ridley on the dvd. Saw the movie again with Scott commentaries and yes, it's not Harrison in the bathroom...but close enough Thanks for the pic and the book exerp. I just wanted to be 100% sure about this information, so, I managed to contact Vic himself through his website and asked him if he could reiterate on the subject. He confirmed that it was him in the bathroom/snakescale scene but that I was to be corrected on one point, the white horse used in the dream sequence was not one of his, although he did provide some white arabs for the movie 'Legend'. This is somewhat puzzling to me because in 'Dangerous Days Making Blade Runner' Ridley states that the unicorn horse was "one of Vic's", which is why I made the presumption. He also told me that the bathroom set was built at Elstree, not Pinewood. Nice work Prodigal. All this makes a good behind the scenes article and portrait of Vic. Thanks for sharing Prodigal...interesting story and a big thanks to Vic to have responded to your question. There is a lot more to the bathroom on the deleted and alternate scenes portion of disc 4 on the suitcase boxed set. Including the fact that Leon is hiding somewhere in the bathroom the whole time! Is there any further mention of Vic in that extra material? Am i right in thinking he was meant to be wedged between the 2 walls above the door at ceiling height. I do have the storyboard of that but it is not clear if it was Leon. Will have to have another look.